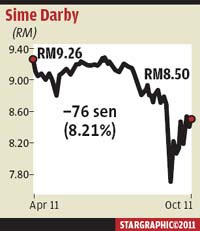 PETALING JAYA: In a move market observers said was not unexpected, the Securities Commission (SC) has concluded that Sime Darby Bhd does not need to make a mandatory general offer (GO) for shares in Eastern & Oriental Bhd (E&O). In separate announcements to Bursa Malaysia, Sime Darby and E&O said the SC had found that Sime Darby and Datuk Terry Tham Ka Hon were not parties acting in concert and as such a mandatory offer obligation would not arise. The SC also told Sime Darby that its finding was without prejudice to a review of the decision should new facts arise and it was the regulator's right to take appropriate action provided under the securities laws as a consequence of such review. Trading in Sime Darby and E&O shares was suspended yesterday till 2.30pm pending the announcement on the SC's decision. The news comes after more than a month of speculation over the implications of Sime Darby's acquisition of a 30% stake in niche property developer E&O for RM2.30 per share, a 60% premium to its then market price. In a statement, the SC said: “In the course of the review (of the circumstances of the acquisition), parties involved in the transaction were interviewed and relevant documents procured. The review included an assessment of possible concert party relationships between and among the parties involved. Precedents in Malaysia and practices and rulings in other jurisdictions on similar issues were also examined. Besides Sime Darby and the three vendors from whom it had bought the 30% interest, the other name in the spotlight was E&O chairman Datuk Azizan Abd Rahman, who had purchased 450,000 shares on the open market in five separate transactions from April to August this year, with the last purchase of 100,000 shares done on Aug 12 about two weeks before Sime Darby announced its acquisition. Azizan is also SC chairman Tan Sri Zarinah Anwar's husband. She recused herself from the review as a result. Although the SC has said a GO was not necessary, the review of all stock transactions by all parties of E&O shares is still ongoing. Sime Darby's purchase, coming just under the 33% threshold that would have required it to launch a GO, had sparked much debate in the market and consternation among minority shareholders of E&O. After both companies resumed trading, Sime Darby shares hit a high of RM8.68 before settling at RM8.50, 1.19% above its closing price on Monday. 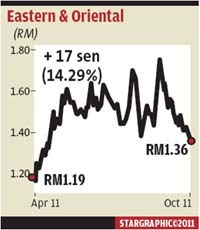 E&O shares, meanwhile, traded mostly below their previous close and ended 1.45% lower at RM1.36. Analysts said the SC's decision came as no major surprise. Speaking to StarBiz, a Sime Darby analyst said the outcome was more or less expected by industry watchers. He said the news would not significantly impact Sime Darby and did not warrant a change in his valuations. Hong Leong Investment Bank Research said in a report that it was positive on the development as it would mean Sime Darby does not have to acquire the remaining 70% of E&O at a GO price that was much higher than E&O's market price. Another analyst pointed out that the bigger concern for Sime Darby was crude palm oil (CPO) prices as the conglomerate derived some 58% of its operating profit from its plantation business. Sime Darby is the world's largest listed palm-oil producer by acreage. CPO prices have come under pressure after the Malaysian Palm Oil Board released figures on Monday that showed supply was getting ahead of demand, as palm oil stockpiles jumped 12.17% in September from August against an 8.8% drop in exports. As for E&O, analysts anticipate its share price could face some selling pressure because the prospect of a GO has diminished. An analyst reckoned that E&O shares might touch RM1.20 on the disappointment of investors who bought into it expecting a GO.